The Sounders will aim for a league record eighth consecutive win in a single season Saturday as they face Sporting Kansas City, the squad they share that MLS mark with. Adding to the tension will be Clint Dempsey's retirement ceremony and the fact the Sounders are still barely clinging to a playoff berth. History is doing the best it can to distract the Sounders from what is arguably their biggest challenge of the season. The Sounders play host to Sporting Kansas City at CenturyLink Field on Saturday and minus a victory have little chance of avoiding the dreaded first-round, single-game knockout stage of the playoffs. Beyond their goal of securing three points, they must deal with the pregame retirement ceremony of forward Clint Dempsey, plus they can set a league record for consecutive wins against the team they share the mark with. It all makes for what should be a memorable, if not historic, afternoon for a team that still is barely above the playoff “red line” as the Major League Soccer season heads into its homestretch. “There is a little added spice to it,’’ Sounders coach Brian Schmetzer said Friday. Schmetzer’s team has won seven straight and gone unbeaten in 10 to vault into the sixth spot in the Western Conference standings where the top six clubs make the playoffs. Kansas City holds the No. 2 position — and a first-round bye — with a seven-point edge the Sounders that can obviously narrow with a victory. Aside from that, the two teams share the MLS record for most consecutive victories in a single season in the post-shootout era, which dates back to 2000. Kansas City set that mark in 2012, winning their first seven matches of the season and outscoring opponents by a 13-2 margin. 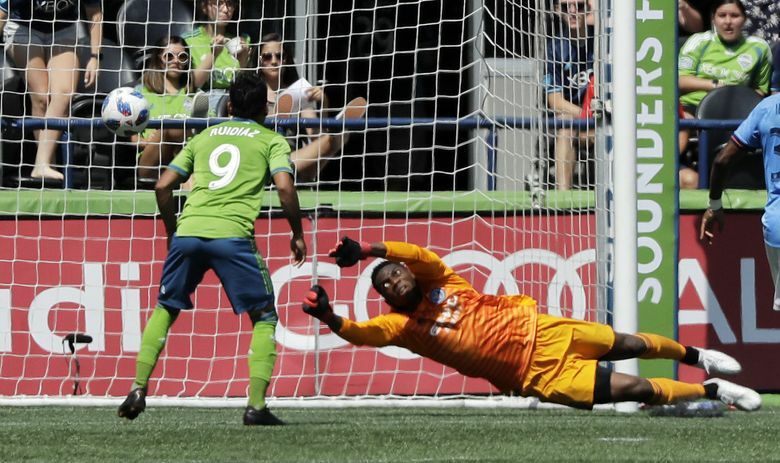 The Sounders have equaled that in an arguably tougher, late-season portion of the schedule, outscoring opponents 16-3. KC played four road games compared to three for the Sounders during this run. Worth noting: KC also won its final two regular-season matches of 2011, meaning it captured nine in a row over multiple seasons. That latter record ultimately meant little, given Kansas City was eliminated in the conference final by current Sounders forward Will Bruin and his Houston team in 2011 and got bounced by the Dynamo again in the 2012 conference semifinal. For Schmetzer, the history part, including Dempsey’s retirement, takes a back seat to present-day concerns. They’ll have to be, with Kansas City coming off its best August, having posted four consecutive shutouts. Sounders defender Chad Marshall, making a case yet again for Defensive Player of the Year consideration, knows penetrating the KC back line won’t be easy. That crowd should be amped-up for the pregame Dempsey festivities and more. The Sounders are the healthiest they’ve been all season, with only midfielder Victor Rodriguez still listed as doubtful for Saturday with continued hamstring woes. Otherwise, they’re at full throttle, with four players — Raul Ruidiaz (Peru), Gustav Svensson (Sweden), Roman Torres (Panama) and Jordy Delem (Martinique) — called into international duty during the two-week break that follows this match. Schmetzer knows that a victory Saturday could make all the difference in how his players perceive that layoff.